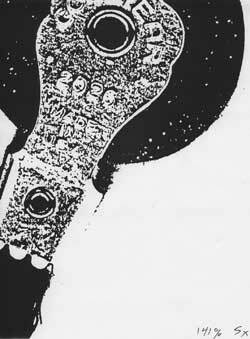 Photocopy machines are an inexpensive and versatile tool in collage. Mostartists are never too far from a copy machine or office supply store with a copycenter. You can buy a personal copy machine with zoom capability fairlyinexpensively, if you really get into it. You can enlarge, make multiple generations, and change the density and otherparameters with a copier. To add color, glaze with paint. Enlarging is oneof the most important techniques. Make your major elements large! Another useful technique is to directly scan small 3-d objects. You can makeprints without a camera. It's fast, direct and fun! The Goodyear eraser, shownto the right, was directly copied and enlarged 141% five times. To experiment further, try moving the 3-d object during the copier scan. GetSalvador Dalí like distortion and other interesting and unpredictible images. Toner transfer works with copy machine prints or laser prints. It will notwork with ink jet prints. It is truly the world's easier print making technique.It gives a black and white, somewhat "grayed" print. The process uses a solvent to transfer the carbon pigment to your artsurface. 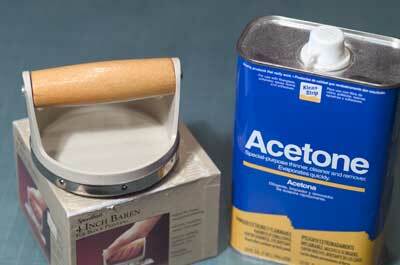 Acetone seems to work the best, but Xylene or paint thinner can betried. It only transfers well to smooth paper. Hot press watercolor paper orbristol board or a panel are the best options. Canvas has too much texture toget a good transfer. Since the copy is placed face down on the surface, theimage will be reversed. If you want a correct reading image, reverse it on acomputer or an advanced copy machine. You also need some pressure. I use a Speedball 4 inch baren, designed forblock printing. They are about $20 and available at most art supply stores. Youcan also use a folded paper towel. If you have access to an art press, you canuse that as well. I sometimes use an old 14" x 22" Vandercook Proof Press madefor relief printing. These solvents are toxic and flamable! I work in the garage next to an opendoor or a large studio. Use common sense. 1. Position your photocopy or laser print face down on your smooth paper.Tape with drafting tape to keep it from slipping. 2. Wet the back of the photocopy or laser print with acetone. Use a spraybottle or pour solvent on a folded paper towel and apply it. I like the spray bottle. 3. Use a baren, paper towel or press to apply even pressure. 4. Remove the photo copy and throw it away. You can only use it once, despitethat an image is still there. A toner transfer demo is done at most of our workshops. It has many other uses, such as creating hand tinted prints and other original art.